Gonimoblast was originally put together in 2013 for the fantastic SOUNDkitchen night in Birmingham. The band works with guest musicians to create music which falls somewhere in the cracks between improvised and electronic music. 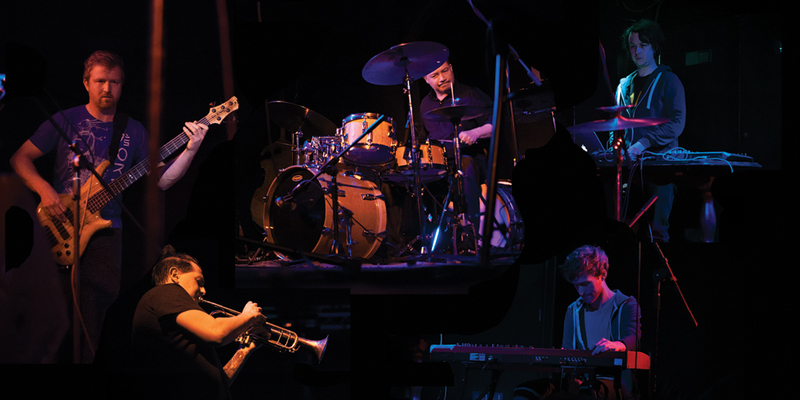 The ensemble has released four albums to date. The first three are available on the band's Bandcamp page. The most recent double album Live with special guests Maja S.K. Ratkje and Arve Henriksen is available via Stoney Lane Records. "It’s electronica, but with plenty of mood-swinging clout"
"One of the finest, most exciting releases of this year....exquisite production"
"Both sets are object lessons of how to listen to other musicians while improvising." "Highly original and strongly impressive"
"This double live album is a plateau from which to view the group’s dizzying progress...It’s slow burning 21st-century music for a time of ceaseless noise." "It's a striking package, an art object in its own right."